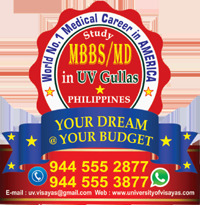 MBBS in Philippines It is the dream of every MBBS aspirant to become a successful doctor one day. Some of those who couldn’t make it in a year try year after year, some give up on theirs and their parent’s dream and take up some other course and finally those who can afford to pay donations take admission in private medical colleges. But are these the only options one has? Well, if you are here and reading this, then you know you have a great option and that option is to study MBBS in Philippines. But perhaps if you are not entirely convinced that studying medicine in the Philippines is the best alternate you have or whether it is good enough or not then Continue reading to know why the Philippines is the best country to do your MBBS from. Between 2012 and 2014 approximately 25% students who studied MBBS from the Philippines cleared the MCI Screening Test.